You know how some weeks you think you’re being told something? This is one of those weeks. I am being reminded to remain open, to be curious and to have courage. Now this is partly because I have stuck post it notes strategically around the house reminding me but I did this in response to getting the nudges and wanting to remember them even when I wasn’t being …reflective! And this has evolved into a mantra. 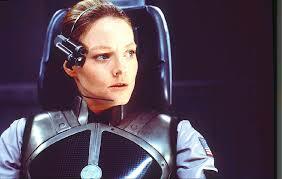 I’m channelling Ellie Arroway in Contact. Yup, folks. Hollywood. I had forgotten what a great movie it was but we watched it again this week when the I’m OK to go line became a bit of a catch phrase for various family members this week! Ellie’s not just telling the folks in control that she’s OK to go. She’s reminding/ convincing/ reassuring herself. Courage is not fearlessness. Courage is being OK to go in the direction that seems best, even if you are afraid; even if you aren’t sure of what lies ahead or what outcomes will be. Courage is going with openness and curiosity; dropping the story lines you attach to things and trying to see things simply as they are. Courage takes practice. This entry was posted in Uncategorized and tagged Contact, courage, Curiosity, Ellie Arroway, no polymer, OK to go, Openness on February 23, 2016 by wendy.